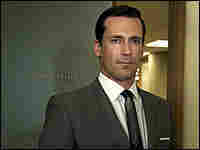 Why I Love 'Mad Men' The season finale of the TV series Mad Men airs Sunday night. The show has a small, devoted following, including commentator Jake Halpern. After two seasons, he's finally figured out why. My name is Jake Halpern, but it was almost Jake Hall. Why Hall? Well, back in 1957 — as my uncle prepared to enter college — my grandparents called together a little family powwow in their apartment in the Bronx. My grandpa Irving expressed his concerns that the name "Halpern" sounded too Jewish and that my uncle might not get into the kind of private colleges that snubbed Jews. My father was 12 at the time, but he still recalls this family gathering vividly. "It was a very paranoid thing to consider doing," he told me. "But it wasn't all that crazy at the time." I've always struggled with this phrase. Sure, I knew the cold dry history. I understood that in the late 1950s and early 1960s, Jews, women, African-Americans, and gays were marginalized. But, it was too far removed from my own experience. By the time I was in college, in the snooty Ivy League — in the early 1990s — the straight, WASP man, dressed in a Brooks Brother shirt was practically an endangered species. My father's descriptions of the past seemed like ancient history or possibly even a figment of his own paranoid imagination. Then I got hooked on the TV show Mad Men. The show brings the early 1960s to life in a way that is so fresh, it almost feels like you are stepping into a time machine. The details — right down to women's underwear — with their girdles — are meticulously recreated. And the vision is dark. For those of you who haven't seen it, the show stars Donald Draper, an ad man who works at a Madison Avenue firm — a real old boys club, a stronghold of WASP-dom — a place where women typed notes, blacks worked as elevator boys, Jews begged to be taken on as clients and gays rarely saw the light of day because they barricaded themselves in the closet. I'm not proud to admit this, but I am reminded of a John Kennedy quote, in which he said that "art establishes the basic human truth which must serve as the touchstone of our judgment." It may be considered lowbrow to call a cable TV show art, but that's precisely what it is. The writing is eloquent, the characters are nuanced, and the stories are deliciously unhurried. And ultimately the show does what art is supposed to do — it illuminates — it sheds light on what a time and a place might have felt like and why, in my case, the changing of a name from Halpern to Hall might have made all the difference. Jake Halpern is the author of Fame Junkies: The Hidden Truths Behind America's Favorite Addiction.